In Myeong-dong, a popular shopping district in central Seoul, many shops post signs in Japanese and hire Japanese-speaking clerks to attract tourists from the neighboring country. So, are these shops enjoying a sales boom? Joy and grief alternate among the shop owners, as most Japanese shop thriftily. Japanese travelers seem to be everywhere in downtown Seoul these days, taking advantage of a weaker Korean won that makes goods here cheaper. According to the Korea Tourism Organization, more than 250,000 Japanese visited Korea from Dec. 1 to 21 in 2008, a nearly 50 percent increase from the previous year. Miho Funada, 25, visited Korea on a three-day trip for shopping with one of her friends. She had already stopped off at shops such as Missha and Etude House, both local cosmetic brands, and bought Korean beauty products worth 140,000 won ($100), and was headed to the Face Shop, also a cosmetic brand. A friend held a guidebook of the district marked with low-priced makeup shops. ``We came to shop because it's cheap,'' Funada said. These Korean cosmetic brands have several shops in the district, including three Missha stores and four Etude Houses. Other brands such as It's Skin, Skin Food and Innisfree have two stores each. ``At stores in Myeong-dong, about 40-50 percent of customers are Japanese. They mostly buy cosmetic items priced at 10,000 won,'' said Kim Chang-soo, an employee at Etude House. ``Forever 21,'' a popular fast-fashion brand, opened its first Korean store in Myeong-dong last October. Clothes there range from 3,500 won to 69,800 won in price and accessories cost 2,000-40,000 won. In November, Japanese visitors started coming to the low-priced store in crowds. ``Most of our customers are Japanese, especially in the morning,'' Betty, the assistant manager of the shop, said, crediting her shop's low prices and ``freshness'' with its popularity. ``We sell the latest fashion items at affordable prices, so it's easy for people to open their purses. The brand does not have branches in Japan and Japanese buyers think it's new and fresh,'' she added. ``Japanese are fastidious in buying clothes. They look around and try on a lot of items but buy only one or two cheap ones. Customers from Singapore and Hong Kong tend to buy much more,'' said Park So-young, who works at an outlet near Ewha Womans University. Grocery stores in Myeong-dong and Namdaemun Market have set up Japanese signs as well. At Dream Mart, a grocery store in central Seoul, pomegranate and omija teas, which cost around 4,000 won each, are the most popular product among Japanese shoppers. The owner, Moon Kwang-youl, hired two Japanese-speaking salespeople to cater to them. 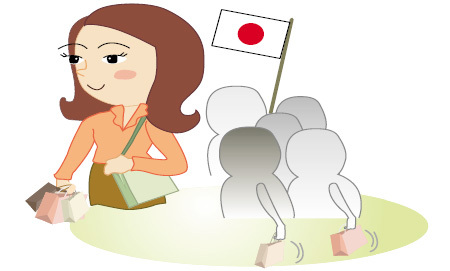 ``On weekends, hundreds of Japanese visit the store daily and buy foodstuff. Some buy Korean tea in bulk as gifts and we send them directly to Japan,'' Moon said. Glasses are another popular item. ``Cheap eyeglasses frames with price tags of around 30,000 won are the most popular,'' said Kang, an optician of Gana Eyewear. According to Kim, the rush and consequent economic effect of Japanese tourists is limited only to the Gangbuk district, or north of the Han River. ``Japanese people shop, eat and stay mostly in Gangbuk. Only a few of them visit luxury shops in Apgujeong-dong in southern Seoul,'' he noted. Park Kyong-soon, a third generation Korean-Japanese who visits Korea two or three times per year, did not buy much during this visit. ``Many of my friends have been coming here more recently due to the proximity and the yen, but Japan is also in an economic slump and they don't buy luxury brands,'' she said.